Classic phasers update 07/01/17 added n4 skins! Classic phasers update 17/01/17 added n4 skins! The pedal contains 1 light and 4 photo cells. A well known pedal! Simple design incorporating simple non opto , lfo driven solid state cascade. More Phase is a classic pedal phaser with a versatile set of controls. It contains 2 lamps(light sources) and multiple photo cells, Making it a very complex pedal! Much Like the the Script 90 this pedal has a non opto , lfo driven solid state cascade with a single speed control. The differences being it has a colour switch which changes the character of the phase. What makes this pedal unique is it’s warmth. Last edited by Tim Petherick on Sun Jan 07, 2018 11:59 pm, edited 9 times in total. Re: New release Classic Phaser Pedals! ok, it´s time to say a hugh thanks to all the realy active nebula developers like you Tim, to Cupwise and all the nearly daily new releases in an unbelievable quality. I´m definitely not one of the users they buy every think but it´s very hard to ignore all the releases and your new offer is hitting me. I´m waiting so long now for an "update" of the old nebula phaser, chorus etc. stuff. your audio demo sounds great. I've got a bunch of choruses that will be made eventually but for now you can enjoy these presets! Last edited by Tim Petherick on Thu Jan 23, 2014 5:19 pm, edited 1 time in total. I am a tone snob, and I love my tube amp, my 79' Strat, and my choice boutique pedals that I have held on to for years.... But releases like this make me wonder why bother with actual hardware in the studio when something this good can be used over and over without ever changing batteries, maintaining electronics, or worrying about breakage. Tim, this is really stunning. Continuous rate slider is really cool. I could use the phaser as a continuous LFO and it sounds smooth. these sound awesome! will definitely be adding these to my collection. I will post some more samples on my site soon. Maybe getting into more specific guitar styles! Of course these can be used for mixing other things but you can see how close they are by some guitar samples! Just let me know if I can help you with guitar demos! I have a few presets on various vocals in some "real" projects, by the way. So while these do seem very at home on guitars, don't hesitate for a second to play with these on other sources.... Awesome on drums too, for occasional "fx" and such. One of the more subtle presets (can't remember this second and am not at my DAW) is sounding amazing on a alt-rock bass part too, really fat and not even losing focus like I had expected it to. Super nice library Tim. The sound samples are very intruiging. Formbank wrote: Very interesting ! And buffer should be low for best results, also to instal names manually to rom file. Not a mod no, I left the Timed mode under 30ms For the reason not to confuse new users, you can adjust the master page setting to 30ms but thats it! For this release It's pretty much essential for a mod on the xml. You have It sorted by the sounds of it. Just been playing with this, AMAZING! 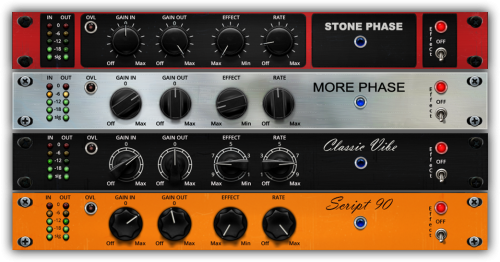 The HQ Stone Phase is the best phaser in a VST ever! Replaced Diva's built in phaser with this one and the difference is massive. Its Jean Michel Jarre time! If the Stone Phase does not have the resonance required then HQ More Phase Emphasis 2 will sort you out, really vintage sounding, no digital horrors! Wish I had time to post examples, synth fans should check this out ASAP!